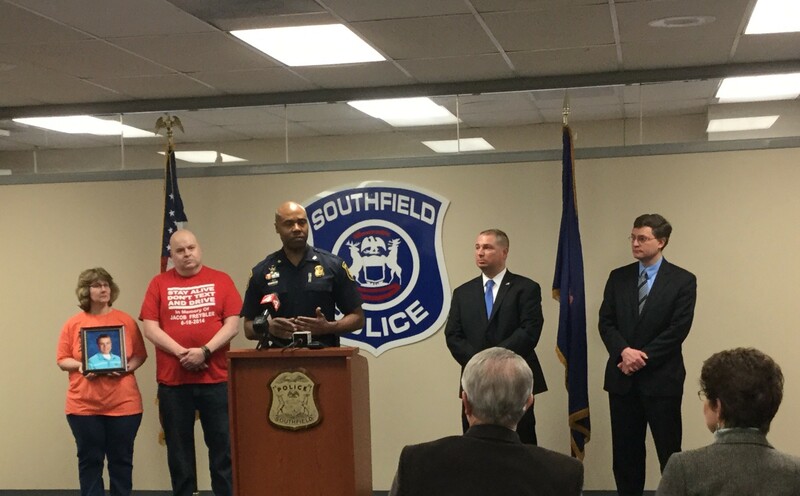 (left to right) Diane and Jim Freybler, parents of Jacob Freybler; Chief Eric Hawkins, Southfield Police Department; Jim Santilli, CEO of the Transportation Improvement Association; and State Representative Martin Howrylak (R-Troy) announce HB 4466, a hands-free bill, on March 31, 2017. SOUTHFIELD, Michigan, March 31, 2017 – Jim Santilli, chief executive officer of the Transportation Improvement Association, and State Rep. Martin Howrylak (R-Troy) today announced distracted driving legislation they’ve designed with the goal of reducing fatalities, injuries, and traffic crashes in Michigan. House Bill 4466 was introduced by Howrylak and co-sponsored by Reps. Jim Ellison (D-Royal Oak), David LaGrand (D-Grand Rapids), Frank Liberati (D-Allen Park), Peter Lucido (R-Shelby Township), and Michael Webber (R-Rochester Hills). The bill states that a person may use a portable electronic device while operating a motor vehicle if the portable electronic device is specifically designed and configured to allow voice-operated and hands-free operation, and is being used in that manner by the person while operating a motor vehicle. If this legislation is signed into law, a driver may use a portable electronic device in hands-free mode as long as the driver can activate or deactivate a function on the portable electronic device with a single swipe or tap of their finger. The portable electronic device must also be safely mounted on the windshield, dashboard, or center console in a manner that does not hinder the driver’s view of the road. The bill calls for violators to receive a civil infraction, beginning with a $250 fine for the first violation. A second violation would result in a $500 fine and 1 point. A third or subsequent violation carries a $500 fine and 2 points. According to the U.S. Department of Transportation, drivers who use a hand-held device are 4 times more likely to get into a crash serious enough to cause injury. Texting drivers are 23 times more likely to be involved in a crash. The bill defines a portable electronic device as a wireless telephone, electronic wireless communication device, personal digital assistant, device that has mobile data access, laptop computer, pager, broadband personal communication device, 2-way messaging device, electronic game, portable computing device, a navigation or GPS device, or any other electronic device that is used to conduct a search or to input, write, send, receive, or read text for present or future communication. A portable electronic device does not include a two-way radio, or amateur radio equipment used by a licensee of the Federal Communications Commission. Use is defined as holding a portable electronic device while conducting a search; viewing, taking, or transmitting an image or video; playing games; or for the purpose of present or future communication, performing a command or request to access an internet page or composing, sending, reading, viewing, accessing, browsing, transmitting, saving, or retrieving an e-mail message, text message, instant message, or other electronic data. The movement for a hands-free law began after Santilli attended the funeral for Ally Zimmerman, a 16-year-old Romeo High School student who was hit by a distracted driver while traveling as an innocent passenger on December 28, 2010. He immediately joined forces with Ally’s family and friends to create the “Remembering Ally: Distracted Driving Awareness Campaign.” The award-winning campaign reached people in more than 90 countries. Santilli and Ally’s mother, Laurel Zimmerman, both agreed that Michigan’s current texting law is too specific and a hands-free law would be easier to enforce. After communicating with public safety leaders throughout the nation to determine the best language for a bill, Santilli officially announced a plan to send a hands-free recommendation to the Michigan Legislature during a press conference on March 30, 2016. Shortly after the announcement, Howrylak reached out to Santilli and offered to sponsor the bill. According to Santilli, California enacted a ban on hand-held cell phone use in July of 2008. “Based on traffic crash records two years before and two years after the hand-held ban went into effect, overall traffic deaths declined 22% and hand-held cell phone driver deaths went down 47%,” said Santilli. Jim Freybler, who lost his son to texting and driving, supports the ban on hand-held cell phone use. TIA is currently creating www.handsfreemichigan.com. The webpage will feature updates and a list of supporters.